We offer Epoxy Repair Mortar all packs are premeasured and they just need legitimate blending at site with whole amount supplied. 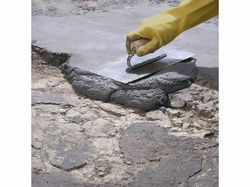 It is a mix of silica totals reinforced together with Epoxy pitch, intended for quick and perpetual repair to concrete. The blended material is connected to suitably arranged and prepared surface. Used for repair of Concrete ,Speedy Installations of Industrial Floors, Structural Elements like Columns & Beams. Looking for Epoxy Repair Mortar ?